As with any sale on ebay, there are associated listing and end of sale fees. I usually recover those costs in shipping and handling. For example, I charged $9 shipping & handling on this sale, but only paid $5 to ship the shoes. Keep those extra charges in mind when setting your shipping and handling charges. Where to find items to sell on ebay ... church! As the New Year begins, so do the New Year resolutions. A popular resolution every year for smokers is to quit smoking. 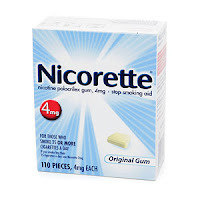 I recently found boxes of Nicorette gum, a smoking cessation aid, on clearance at a local retail shop. The clearance price was $12.99 and I had a coupon good for $10 off a box of Nicorette gum, original flavor. I paid $2.99 for the box of Nicorette gum and sold it for over $25!